Sketching in front of your computer has become much easier and cheaper thanks to programs like Skencil. Skencil is a vector drawing software that helps artists and enthusiasts create beautiful sketches on their computers. In spite of the name change (it was formerly known as “Sketch”) all of the features and GUI remain intact. The program is very helpful for creating illustrations, diagrams as well as other types of drawings. The entire application is created almost entirely from Python which is makes it highly specialized yet still easy to use. 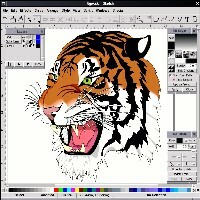 Although the program is still in its initial stages, Skencil is a very usable program. The most stable release is version 0.6.17. Even as we speak, the program is still continually developed and minor changes are constantly being done to improve the software. Skencil is similar to Inkscape with several major differences. The program itself is very easy to use and there are hardly any problems when it comes to creating your artwork. Bezier curves are one of the features included in the program and they work great thanks to Python. Moreover, the program can be used for .ai files if you have used Adobe Illustrator before. The truth is that the program does offer unique features which might work great for certain things. However, progress or improvements for the program are a bit slow in the making. With such slow updates, it can be frustrating to wait for the program to reach its full potential.